DH has the new Anthony Bourdain series on and this episode is featuring Libya. I'm craving the breakfast that he's eating on the show. It looks like a big flat fried donut with two eggs cooked to medium in the center. Yumm... who can resist fried dough and dippy eggs? What I find shocking in this episode is that the rebels overthrew the monarchy two years ago using Twitter to communicate. Amazing! 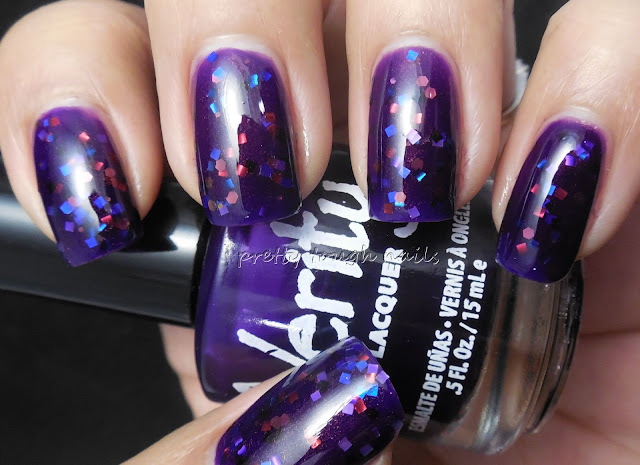 When I made my birthday haul a couple weeks ago, I picked up some Verity polishes at one of my favorite nail supply stores in Orange county. 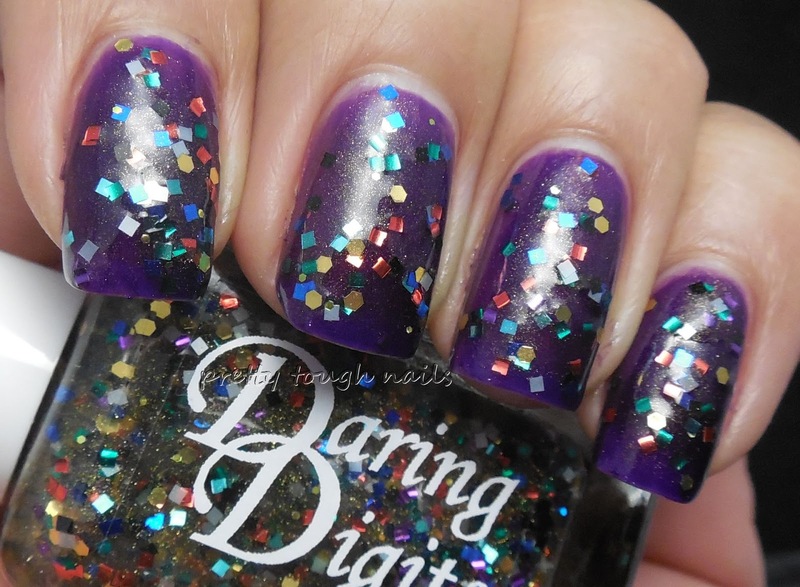 I've always wanted to try Deep Violet, a popular purple jelly but I never wanted to pay for the shipping via Amazon. I'm glad I waited, because the Verity line finally popped up at the nail supply for a whopping $1.25 each. Winning! Maybe one of these days I'll compile a list of the stores I like to go to along with the brands they carry. 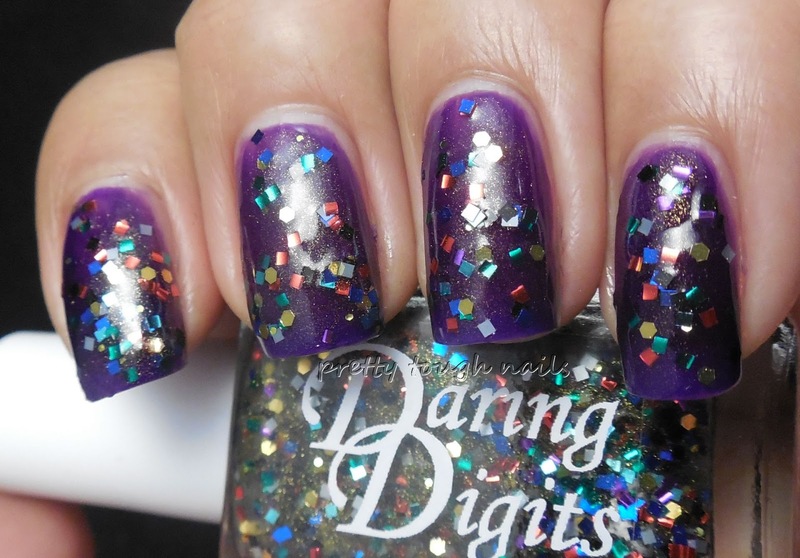 For this mani, I started with three layers of Deep Violet. Like any jelly, it was sheer on the first coat but was fairly opaque at three coats. You can see a little VNL in the pics but it's not really visible IRL. No topcoat in these pics to show its full squishy goodness! I had Daring Digits Guy Manuel hanging around on my swatch table so I decided to try a quick sanmmich. Here is one coat of Guy Manuel on top of Deep Violet. It's got a multiclored hex squares, gold hex glitter, and gold shimmer. 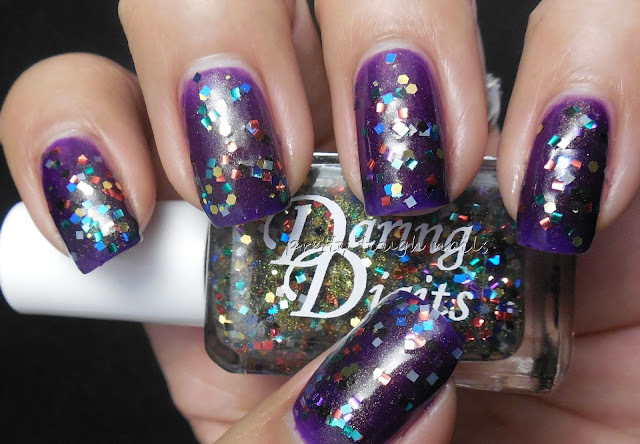 It applied slightly thick like most glitter topcoats, but I had even distribution of glitter with one coat. After using a polish named Guy Manuel, now who has Daft Punk's Around The World now stuck in their head? That would be me! Next, I used one layer of Deep Violet over the glitter and bam! Look at that gorgeousness!! 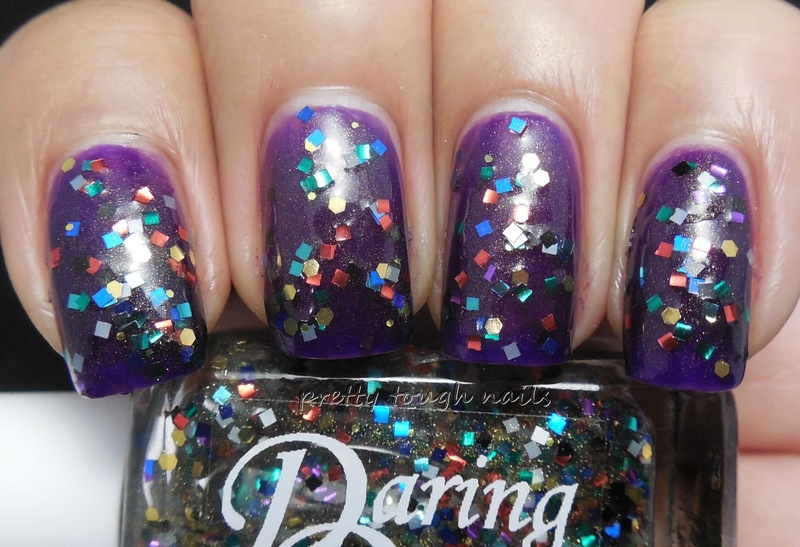 You can still see some of the gold shimmer peeking through and the glitter gives the jelly amazing depth. If you're wondering how this compares to L'Oreal Berry Nice, I would say that Deep Violet a little more plummier, and a touch warmer. Berry Nice is cooler and leans more eggplant IMO. Do you need both in your collection? Probably not. I would probably recommend Verity Deep Violet over the L'Oreal if you can find it, especially at $1.25, mostly because it took less coats to become opaque. One thing is for sure - you definitely need to have at least one of them. A purple jelly should be a staple in anyone's collection! This is nice! I've seen the Verity polishes at the beauty supply store but never gave them a second glance. I may have to give them a try! 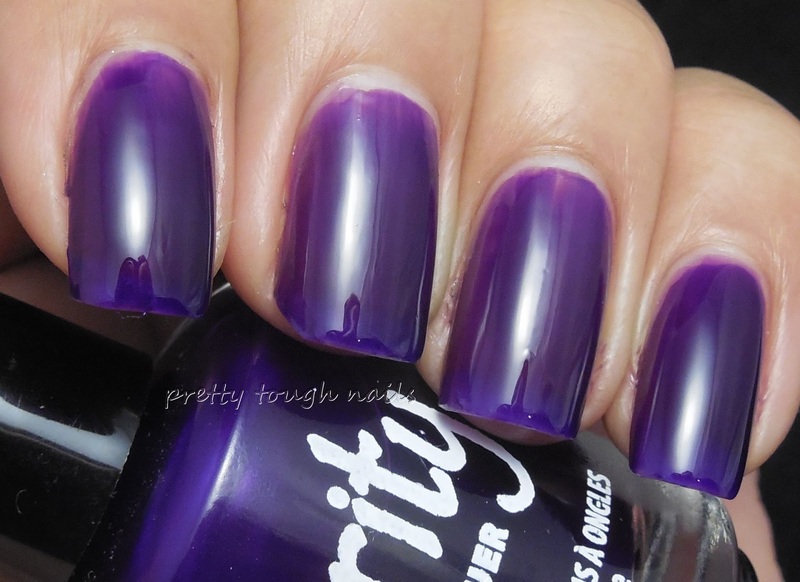 I heard that there were other Verity jellies available but I couldn't find any aside from Deep Violet. If you find one, I'd love to see a swatch!